Traditional habitat knowledge is an understudied part of traditional knowledge. Though the number of studies increased world-wide in the last decade, this knowledge is still rarely studied in Europe. We document the habitat vocabulary used by Csángó people, and determine features they used to name and describe these categories. Csángó people live in Gyimes (Carpathians, Romania). The area is dominated by coniferous forests, hay meadows and pastures. Animal husbandry is the main source of living. Data on the knowledge of habitat preference of 135 salient wild plant species were collected (2908 records, 44 interviewees). Data collected indoors were counterchecked during outdoor interviews and participatory field work. Csángós used a rich and sophisticated vocabulary to name and describe habitat categories. They distinguished altogether at least 142–148 habitat types, and named them by 242 habitat terms. We argue that the method applied and the questions asked (‘what kind of place does species X like?’) helped the often implicit knowledge of habitats to be verbalized more efficiently than usual in an interview. Habitat names were highly lexicalized and most of them were widely shared. The main features were biotic or abiotic, like land-use, dominant plant species, vegetation structure, successional stage, disturbance, soil characteristics, hydrological, and geomorphological features. Csángós often used indicator species (28, mainly herbaceous taxa) in describing habitats of species. To prevent reduction in the quantity and/or quality of hay, unnecessary disturbance of grasslands was avoided by the Csángós. This could explain the high number of habitats (35) distinguished dominantly by the type and severity of disturbance. Based on the spatial scale and topological inclusiveness of habitat categories we distinguished macro-, meso-, and microhabitats. Csángó habitat categories were not organized into a single hierarchy, and the partitioning was multidimensional. 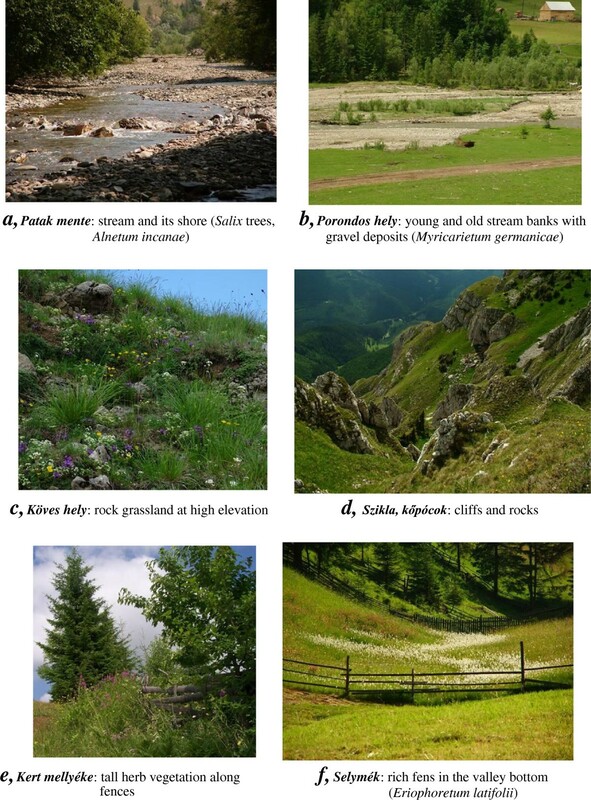 Multidimensional description of habitats, made the nuanced characterization of plant species’ habitats possible by providing innumerable possibilities to combine the most salient habitat features. We conclude that multidimensionality of landscape partitioning and the number of dimensions applied in a landscape seem to depend on the number of key habitat gradients in the given landscape. Vegetation- and habitat-related knowledge of human societies has been accummulating for millennia. Vegetation and landscape knowledge that developed independently (or mostly independently in European landscapes) of science is studied by ethnobiology. Ethnobiologists seek to understand how different peoples perceive, classify, and mentally process the living world, and how they then apply that knowledge . In the last decades, habitat and vegetation-related knowledge of many peoples was studied. However, it was only Johnson and Hunn  who introduced the term landscape ethnoecology. Landscape ethnoecology focuses on the ecological features of a landscape (e.g. ecotopes, habitats, vegetation types, and other landscape elements), and aims to understand how the living landscape is perceived, named, imagined, classified, and managed by people who live in it. Traditional habitat knowledge has been documented in detail in only a few cases in Europe: in the French Alps [3, 4], in the Hortobágy salt steppe in Hungary , and based on toponyms in two areas in Transylvania, Romania [6, 7]. There are probably a number of reasons for this. First, this sort of traditional knowledge may have been lost by now or is at the verge of extinction in Western Europe . Second, Western European ethnobiologists tend to work outside of Europe almost without exception. Meanwhile, in the countries of Eastern and Southeastern Europe, which are still rich in this sort of traditional knowledge, this type of research is missing. It is surprising that studies specifically focusing on traditional folk knowledge of vegetation have appeared in the international literature only in recent years [9–26]. In Europe, traditional land-use and the connected traditional ecological knowledge have survived mostly in agriculturally marginal areas. Our research was carried out in a mountainous environment, in the zone of spruce forests of the Carpathians. In this environment, hay meadows and highland pastures alternate with spruce forests. The species-rich grasslands of this zone are all anthropogenic in origin . As they were formed after deforestation, they tend to be re-occupied by forests when regular management ceases [27, 28]. Thus, their survival depends on the continuity of human intervention. The maintenance of grasslands (hay meadows, pastures) requires precise knowledge of the habitats from both traditional farmers and nature conservationists. However, traditional knowledge related to these habitats has not yet been well documented. Traditional ecological knowledge is transferred from generation to generation, while in a traditional community each generation adds its own observations [6, 29, 30]. Farming based on traditional knowledge often created landscape utilization patterns that survived on the long-run [31–33]. Meilleur  argues that in the French Alps (Les Allues Valley), landscape pattern is regarded as essentially unaltered, and farming practices remained similar from the (14th) 16th to the beginning of the 20th century. However, Meilleur  had to rely on living memory in his ethnobiological study, as traditional farming had been abandoned by the 1970s-1980s. Even so, he was able to document nuanced knowledge of habitats (20 main habitat types [3, 4]). These were used by the local people in a well developed farming system of fullfield agriculture, arboriculture, and forestry along with mowing, grazing, animal-husbandry, and confection of milk products. It is worth noting that farming practices in the Les Allues region in the first half of the 20th century seem to be surprisingly similar to those that are still practiced in our study area in the Eastern Carpathians. 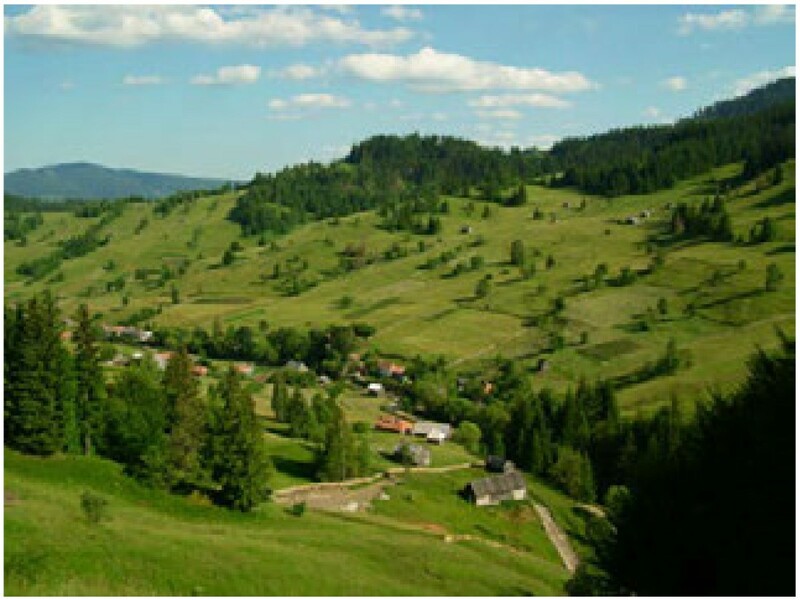 Traditional land-use in the Carpathians is also based on detailed local knowledge of vegetation and habitat. This has already been documented in two landscapes: in Kalotaszeg, west of Kolozsvár (Cluj) and in the Gyergyó Basin, in the Eastern Carpathians [6, 7]. These authors elicited the living knowledge of plant species, but did not study the living knowledge of habitats. Instead, they reconstructed folk habitat categories found in the landscape by linguistic methods based on historical and contemporary toponyms. Even with this methodology they were able to reveal a very detailed habitat vocabulary. While folk plant (and also animal) classifications are usually hierarchical see e.g. , Hunn and Meilleur  found that habitat categories tend to be ordered into a single, but less hierarchical (shallow) landscape ethnoecological partition. Phytosociological units used by botanists are also classified into a single, though highly structured hierarchy see e.g. . Hunn and Meilleur , Fleck and Harder , and Shepard et al. argue that folk habitat classifications are usually multidimensional. Our preliminary study  also showed signs of shallow hierarchy and multidimensionality. We consider landscape partitioning to be multidimensional if several distinct sets of salient environmental features are used – consciously or unconsciously – to define habitats, and thus habitats cannot be arranged along a single dimension. 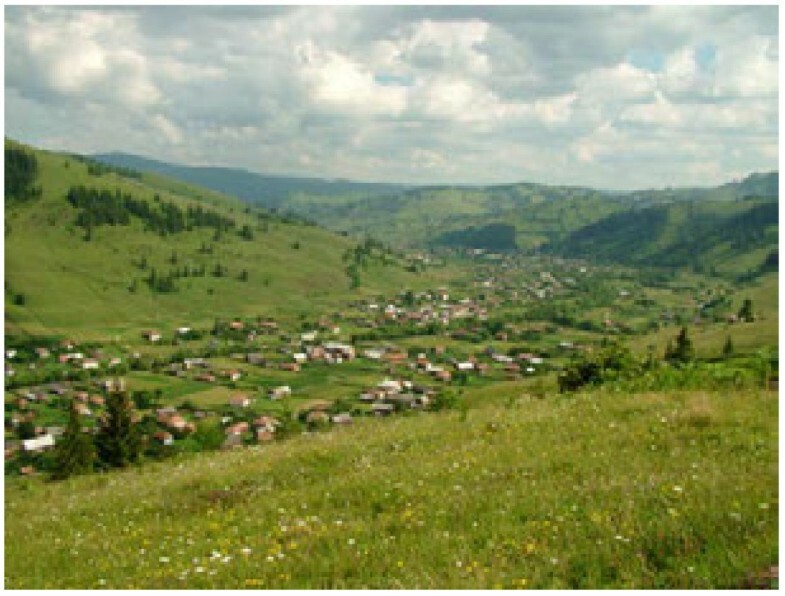 In this paper, the traditional habitat knowledge of Csángó people living in Gyimes (Eastern Carpathians, Romania) is introduced. We identify the habitats into which Csángós partition their mountainous landscape and the features they use to distinguish these habitats. We also document the role of species composition in differentiating habitats, and determine whether it is possible to arrange folk habitat categories into a single landscape ethnoecological partitioning. The study area (Gyimes), is located among the mountain ridges of the Eastern Carpathians (coordinates: N 46°37’22.45”, E 25°57’24.06”) (Figures 1, 2, 3, 4). This part of the Carpathians is made up of sandstone ridges, although limestone also reaches the surface in the study area. The Eastern Carpathians are not a compact mountain range, as it is dissected by several valleys and basins; it is formed by crystalline rocks, and flysch . The elevation varies between 900 and 1500 m. The highest peak is the Naskalat (1553 m). The climate is montane (boreal). The yearly mean temperature ranges from 4 to 6°C, and the annual precipitation varies from 700–800 mm in the valleys to 1000–1200 mm on the mountains . The most significant river is the Tatros with several tributaries of which the largest is the Hidegség. Our study area was restricted to the extensive valley system of the latter. The study area - Gyimes - in the Eastern Carpathians, Romania, Central Europe. The valley bottom with the village in the study area. Inner hay meadows near the settlement, potato fields, houses and forests in Gyimes (Romania). 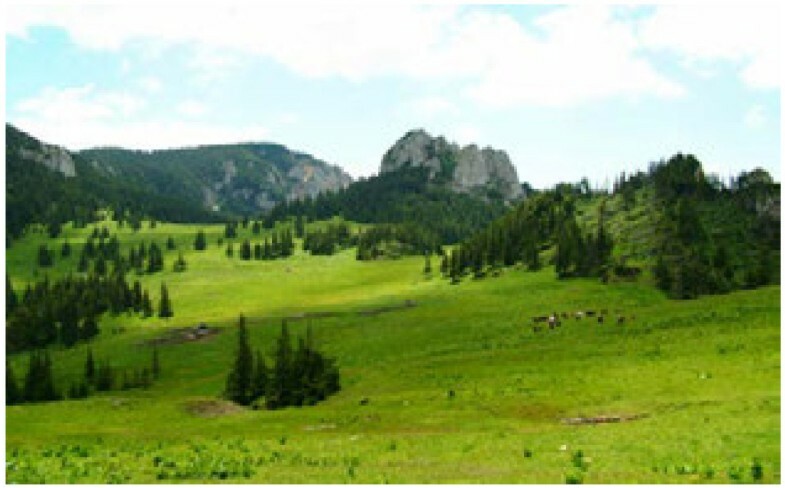 Mountain landscape with pastures, forests and rock outcrops in Gyimes (Romania). This area falls within the Carpathian district of the Central European Floristic Region. Its vegetation is very diverse with many habitats (see Figures 5, 6, 7). The most common forest tree is spruce (Picea abies). The majority of the 614 vascular plant species we documented have Eurasian (29%), European (13%) and circumpolar (12%) distributions. The number of relicts of the Quaternary Period is high . Typical endemic species are e.g. Viola declinata, Campanula carpathica, and Hepatica transylvanica. Almost the entire area was formerly forested, and lies within the belt of spruce forests between (600) 1200 – 1600 m. Beech forests also occur, but are very limited in extent (for additional plant associations described by phytosociologists based on dominant, characteristic, and differential plant species typical of the study area, see Table 1. a .
Trifolio medii-Melampyretum nemorosi Dierschke 1974 etc. The Gyimes area was a political border zone of the Hungarian Kingdom with no record to its intensive use before the 18th century [40, 41]. The area was owned by the villages 14–20 km to the west on the other side of a high mountain range. Early 17th century archive sources document the construction of a border protection system, to which food and other resource was provided by the above villages . The souces do not mention any permanent human populations in the Gyimes area. Sources reporting on the Tatarian raids in 1694 do not refer to any settlements or inhabitants in the Gyimes either . The first church was built only in 1782 close to the border . The Gyimes area was covered with 75% forest in 1792. There were narrow stripes of grasslands and roads in the main valleys (Tatros). Exploitation of the timber resources in the area became possible only after the building of the railway in 1897. These data suggest that the area was settled comparatively late. Immigration from the west (Transylvania) and east (Moldva), and deforestation began only in the 18th century. The forested area was rapidly reduced in order to create pastures and hay meadows . About 45% of the original forests were cut in the first half of the 19th century . The pattern of the landscape was stabilized afterwards, and the resulting grassland-forest mosaic characterizes the landscape structure even today . The Gyimes Csángó is an ethnic group with about 14,000 members living in the valleys of the Tatros and its tributaries. Their native tongue is Hungarian. The Hungarian language is an agglutinative language that belongs to the Uralic language family. The Csángós in Gyimes speak a specific dialect (a transition between the Moldavian Csángó and the Transylvanian dialects). Their culture, particularly their dance and folk song culture, folklore, religious life, dress, characteristic life-style and customs, which were all in use until recently, have preserved a number of archaic elements see e.g. [40, 43–45]. The local culture has been under transformation since the change in the political system in 1989, and increasingly depends on market conditions, while emigration has started. The delayed onset of cultural transformation was due to the minority status of the Csángó community. Preservation of the spoken language and the characteristic cultural traditions was an act strengthening local identity and expressing national identity of the community. In the second half of the 20th century during communism, socialist cooperatives did not exist or only partially functioned in the Csángó territory. Csángós own their land (arable fields, pastures, meadows, and partly also the forests). The smallest economic unit in Gyimes is the family. An average family owns 3,8 ha of land . Csángós are famous for their inter-familial cooperations called kaláka. During periods of intensive work (e.g. hay making, construction of a house), families help each other on a reciprocal basis. The Gyimes people still live in a comparatively semi-subsistence farming system. Animal husbandry and small-scale dairy production are the key sources of income- in their local economy [46, 47]. In other alpine farming systems like the one in Gyimes, the contribution of animal husbandry to the total food output of farming was more than 80 % . At present, 61% of the income in an average family comes from non-agricultural activity, 17 % from subsidies, and 22 % directly from marketing agricultural products . The period suitable for grazing is limited to May-October. For this reason, a large amount of hay has to be collected and stacked. Csángós greatly depend on the quantity and quality of the biomass produced in their landscape. Until recently, a substantial proportion of the hay was mown by hand, but then the scythe was replaced by small motorized mowers. Owing to agri-environmental subsidies, mowing with scythe is again slightly spreading. Arable agriculture has lower importance. The only crop Csángós produce in large quantities is potato, the surplus of which is sold at the market or exchanged for grapes, or vegetables. The role of gathering to supplement their diet is considerable (mushrooms, Rubus idaeus, Vaccinium spp., Fragaria spp.). According to our own estimates, Csángós spend approximately 210 days yearly outdoors . Csángós possess significant ecological knowledge that is utilized in their traditional farming activities [36, 42, 49]. They know many of the plant (and also animal) species in their environment. They recognize at least 294 plant species, which they classify into 207 folk taxa . We conducted our study in the community of Gyimesközéplok (Lunca de Jos), in Hidegségpataka (Valea Rece) during 202 field days between 2005 and 2011. Data on the knowledge of plants and habitats, and the knowledge related to vegetation dynamics were collected from 44 people, of which 4 were younger than 20 years, 11 were between 20 and 60 years, and 29 were older than 60 years. All live in Gyimesközéplok-Hidegségpataka, and most of them were also born there. A small fraction was born in Háromkút (Trei Fântâni) founded by Csángós from Gyimesközéplok. Data were collected during indoor and partly outdoor semi-structured and structured interviews, and participatory observations . First, local names of wild plants were collected. Most plant species have only a single local name, and the number of synonyms is low . This suggests that the knowledge of plant species is still actively used, and is shared widely in the community. We asked questions about the habitat preferences of 135 of the identified plant folk taxa. To avoid confusion, we identified uncertain species with the help of colored paintings . After testing different questions, we collected data by asking the question of ‘what kind of place does species X like?’. The question of ‘where does species X grow’ brought answers on the specific locality the species occurred in. With additional questions (e.g. ‘what should we know of this species/habitat?’) we gained detailed ecological characterization of the habitats. The reliability of our data was checked during participatory observations in the field. We asked people to define and describe the ambiguous habitat terms. In the field, we listened to their conversations, and also asked the name of certain spots to gain insights how Csángós structured their local environment. We collected data on the habitat requirements of 129 species / informant on average. We asked 3620 questions altogether, of which 80.3% were sufficiently detailed for further analysis (2908 records). 35 h of sound recording were transcribed. All habitat names and expressions describing a habitat were sorted out. As supplementary data collection, we collected all the geographical names from the studies of Ilyés (unpubl.) and Rab  that were related to habitats. With the help of three knowledgeable Csángó respondents, we selected from these the names that are still in use in Gyimes as a habitat name. There is diverse terminology for landscape elements in ethnobiology: e.g. ecotope, habitat, kind of place, biotope . We chose to use the term habitat, since in Europe this is the most widespread term that includes all living creatures on a piece of land with its soil, bedrock, and hydrology. A habitat is mostly defined by its vegetation, and is more or less a synonym of ecotope (the suggested term by [2, 22]). Clustering of habitat terms into sets in tables (see below) resulted more from an etic assessment on our part than from any concerted effort we undertook to explore whether they were kinds of natural sets for Csángós. We regarded all terms in the habitat sets as a habitat term irrespective of their other meanings in the local language (e.g. a type of bedrock (clay), or a type of property (garden) cf. ), because all originated from answers to our key question (or participatory field work or from counterchecked toponyms). Csángós identified altogether at least 142–148 different habitat categories, and named them by 242 terms (Figure 8). Most names were widely shared among the Csángós. Csángós identified habitats using various features: land-use, dominant plant species, vegetation structure, successional stage, disturbance, soil characteristics, hydrological, and geomorphological features. Csángós use practically all parts of the landscape in some way or another. Thus, essentially all parts of their environment (about 99%) may be associated with a habitat type classified based on how a piece of land is used. This is the most frequent way of grouping habitats used by the local people (Table 2). Superscripts indicate scale: 1macrohabitat; 2mesohabitat; 3microhabitat. These habitats (20 habitats, e.g. meadow, pasture, arable field, woodland, settlement, Figures 5, 6) cover the largest geographical area, and formed the basis of Csángó landscape ethnoecological partitioning. For defining habitats of plant species, Csángó people used these land-use habitat terms, completing them with additional, more refined categories. The presence of a dominant plant species is often a salient feature in the more detailed partitioning of the landscape (31 habitats, Table 3). These categories were not defined by their species composition (as scientific plant associations are). Instead, these terms indicated only the dominant or most salient species of the area described. 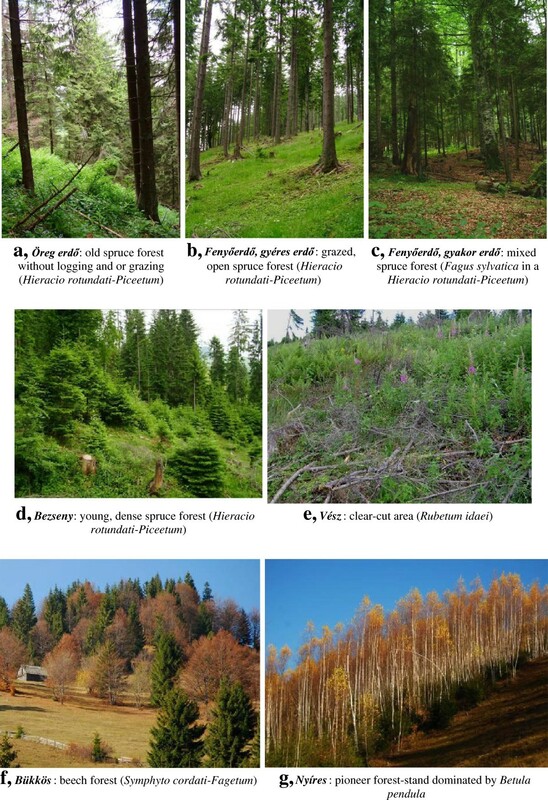 Besides dominant species (such as Picea abies, Figure 5b,c, Nardus stricta, Figure 6h), locally abundant, ecologically conspicuous species were used for the recognition and naming of habitats (for example, Betula pendula, Figure 5g, Acer pseudoplatanus, Sorbus aucuparia, Taxus baccata, Vaccinium myrtillus). Deciduous forest, dominated by Fagus sylvatica mostly mixed with Picea abies (beechy, beech forest / leafy forest). Vegetation structure also was a salient feature (15 habitats, Table 4, Figure 5b,c). Csángós primarily separated wooded and treeless habitats on the basis of vegetation structure. In the case of forests, the structure of the tree stands and the characteristics of the forest edges were salient features. Csángós also recognized and named habitats created by natural or human disturbances. The most significant of these disturbances was clear cutting. The successional stages following clear cutting were all clearly separated in detail (14 habitats, Table 5, Figures 5e, 6h, 7b). In some cases, they even distinguished two types of clear-cuts: places of former spruce and beech forests. In the case of abandoned arable fields, Csángós did not distinguish additional stages besides the one dominated by Taraxacum officinale, which was considered as the first colonizer. Older grassy fields developed over abandoned fields were called hay meadows and were not distinguished in any other way. Additional disturbances creating places were manuring, trampling and grazing of animals, and the presence of once settled sites (15 habitats, Table 6). In addition to their biotic and abiotic features, these places were often characterized by indicator species (i.e. Rumex alpinus, Figure 6g, Urtica dioica, Potentilla anserina). Habitats that are named after natural disturbances were gravel deposits in and adjacent to streams (Figure 7b), and rarely windfall or burnt areas in forests. Habitats in the neighborhood of buildings and roads were particularly disturbed. Habitats in this set were characteristically weedy in species composition (6 habitats, Table 7). Csángós identified many habitats by abiotic features (e.g. soil, hydrology, geomorphology). Many names contained the word ‘place’ (e.g. thin place, stony place, wet place). Part of the descriptive characteristics based on soil types was supplemented by geological details (bedrock type) (15 habitats, Table 8, Figure 7c,d). The partitioning of wetlands also was detailed (12 habitats, Table 9, Figure 7a,f). Given that the area is mountainous, topographic and geomorphological features were salient (17 habitats, Table 10). For some habitats, elevation (a.s.l.) and exposure were the most salient features. Csángós often applied more than one feature to describe the habitat of a plant species. We present examples of the typical habitat descriptions of two folk taxa (Table 11). We selected species whose habitat preference was uniformly assessed among the Csángós. "It only likes sunny places, where it is stony." "Bartacin grows on inner mountain slopes, which are not manured. If manured, it disappears. In hay meadows." "Bartacin likes sunny slidey places. Likes stony places, and gravel bars. If flooded, with gravel, poor, bartacin grows. There is a lot here on sunny slopes in the hay meadows." "Hecselli grows on sunny, slumping slopes, not on northern slopes. It grows everywhere here on the sunny slopes on the pasture, where it is a bit slumping, stony." For precise habitat description of particular plant species, Csángós used indicator species. In these cases, the typical answer was: “It likes (grows in) places where species Y grows.” Twenty-eight such species were documented (Alchemilla spp., Carex spp., Carlina acaulis, Fragaria viridis, Gentiana asclepiadea, Juniperus communis, Leontopodium alpinum, Lonicera xylosteum, Matricaria discoidea, Myricaria germanica, Nardus stricta, Onobrychis viciifolia, Petasites albus, P. hybridus, Picea abies, Plantago lanceolata, P. media, Ribes alpinum, Rubus idaeus, Salix caprea, Salix spp. (S. elaeagnos, S. pentandra, S. purpurea, S. triandra), Spiraea chamaedryfolia, Tragopogon orientalis, Tussilago farfara, Urtica dioica, Vaccinium myrtillus, V. gaultherioides, V. vitis-idaea). Species used as indicators of other species’ habitats occurred in 3.5% of all answers. Additional indicator species were used to make a distinction between meadows based on the quality of hay (Table 12). The spatial scale of landscape partitioning was highly variable. We distinguish three groups of habitats depending on their spatial scale. Habitat categories that refer to larger areas comprising a mosaic of habitats represent macrohabitats (e.g. up in the mountains, inhabited place). Others (called mesohabitats) refer to an area with a more or less homogenous vegetation (often corresponding to scientific plant associations) (e.g. spruce forest, area dominated by Juniperus, clear-cut). The third group of habitats (microhabitats) indicate small areas which stand out from their surroundings or provide a special small scale environmental niche (e.g. ant hill, next to a tree trunk, at the wall of a barn). The scale of habitats is indicated in Tables 2, 3, 4, 5, 6, 7, 8, 9, 10 by upper indices. Csángós recognized and named at least 142–148 habitats. This number is higher than in any other landscape partitioning ever studied in the world cf. . Though Fleck and Harder  estimated 178 rainforest habitat types (104 primary and 74 secondary forest habitats) that the Matses in the Peruvian Amazon might distinguish, only 47 of them were named. Csángó habitat categories closely reflected the diverse habitat pattern of the valley bottoms. In the mountains, however, partitioning was less detailed. Consequently, the majority of folk habitats was concentrated in and around settlements, similar to what was found in the Alps [3, 4]. Our high number of folk habitat categories was not simply the result of the diverse mountainous landscape, nor did it reflect solely the deep ecological knowledge of the local Csángó people, but was also the consequence of our in-depth investigation cf. . We argue that the method of our research and the questions we asked made it possible to elicit such a high number of habitat terms. The knowledge of habitat preference of plant species was mostly the result of personal experience, and, as such, was mainly implicit cf. [13, 26, 52]. By asking the question „what kind of place does species X like?” we “forced” people to verbalize their knowledge related to habitats. Admittedly, this method prompted informants to answer a strange, culturally inappropriate question cf. . We argue, however, that in this way, the rarely shared, rather implicit knowledge was verbalized more often than usual in a conversation or an interview. Even with this method there were habitat names (e.g. tepsányos – a type of fen) that were only elicited after many months of field work, although, as turned out later, they were known with the same meaning by all successive informants we asked. Csángó habitat categories were more or less discrete units, but often had diffuse boundaries with neighboring types, because the selection and delimitation of prototypic types along continuous topological and topographical gradients is not obvious [4, 22, 24], see e.g. “choeni ovogeshi” – transitional zone from floodplain to uplands, documented by Shepard et al. . This phenomenon is not unknown in folk biological (species) classification systems either, though classification difficulties are usually smaller in them , and the spatial delimitation of tokens is usually not a problem. However, classification of taxa further from the so-called core taxon at the periphery of the prototype faces similar classification difficulties (cf. prototypicality effect , prototype extension model ). The great majority of the habitat names was known by all Csángós, which was thus part of their shared knowledge. The kaláka (a type of inter-familial collaboration) could be one of the key platforms of knowledge sharing. The Csángó landscape ethnoecological partitioning was highly lexicalized and had only few synonyms (all are listed in Tables 2, 3, 4, 5, 6, 7, 8, 9, 10). This is in contrast to the findings of Molnár [5, 54] who reported a large number of synonyms (up to 17) in a steppe landscape, which he attributed to the erosion of knowledge, limited sharing and the diverse origin of the local community. Similarly high level of lexicalization was observed among South American tribes [10, 11, 35], whereas the opposite was found in Southeast Asia . The reason for the latter was likely the implicit nature of knowledge and not the lack of substantive knowledge. Csángós distinguished habitats by the following features: land-use, dominant plant species, vegetation structure, successional stage, natural and anthropogenic disturbances, soil types, hydrological features, and geomorphology. In a similar high mountain environment in the Alps, Netting  and Meilleur [3, 4] found similar features used in the recognition and naming of habitats. Johnson also documented the importance of similar features (physiography, hydrologic features, vegetation and wildlife habitats) among Kaska Dena, Gitksan, and Witsuwit’en First Nations in Western Canada [13, 26]. The use of abiotic and biotic features (typically vegetation-related ones, e.g. physiognomy, dominant and/or salient plant species cf. [10, 11]) was typical among the Csángós, as was found in a number of communities in the world e.g. [10, 11, 25, 35]. As opposed to some tropical peoples [11, 21], and the First Nations in Canada , Csángós usually did not consider the presence and absence of animals indicative of habitat types (but see one exception below). Expressed distinction of primary (non human-transformed) habitats and semi-natural habitats was not typical in Csángó landscape partitioning. This is in contrast to the well-documented basic dichotomy found in the classification systems of several tropical people (see e.g. the primary forest vs. secondary forest in swidden systems) [10, 11, 21]. It is perhaps because the entire area has been exposed to farming or forestry activities, resulting that the whole landscape has been rather significantly altered. There was only a single – rare and small in extent – habitat type known that was characterized by the absence of anthropogenic influences: it was the vadas hely (wild place – area not affected by humans; territory of wild animals). Csángós do their best to minimize disturbance during farming. Natural and anthropogenic disturbances usually reduce the amount and/or quality of biomass, which Csángós try to avoid. This might be a reason why disturbance was a salient feature in their landscape ethnoecological partitioning. Disturbance may have been regarded as the main feature in 29 habitats. To counteract the effect of disturbance, Csángós tended to facilitate regeneration in several ways. They, for example, sowed seeds of Onobrychis viciifolia cf. in the dry, south-facing slopes to restore the continuity of the grass mat. Certain gaps in the grass were restored by sowing hayseeds collected in barns cf. , Babai and Molnár unpubl. The overwhelming majority of ethnic groups of which landscape partitioning has been studied so far live either in the tropics or the boreal zone. As a consequence, their habitat vocabulary focuses on the dichotomy of forested and cleared, cultivated areas [10, 11, 15, 26], but see [21, 25]. In Gyimes, where 99% of the landscape is under ‘cultivation’ (arable, pasture, meadow, or managed forest), habitat categories identified by their land-use formed the basic-level habitat partition. The economic importance of grasslands is greater than that of forests and arable fields due to the greater share of animal husbandry in the Csángós’ farming economy. Hay meadows are the most significant habitats in terms of survival, because they provide fodder for winter that should last up until May. The Csángós’ management of hay meadows is meticulously detailed. Thus, the habitat set of hay meadows also was much more detailed than that of other sets (e.g. pastures, forests). 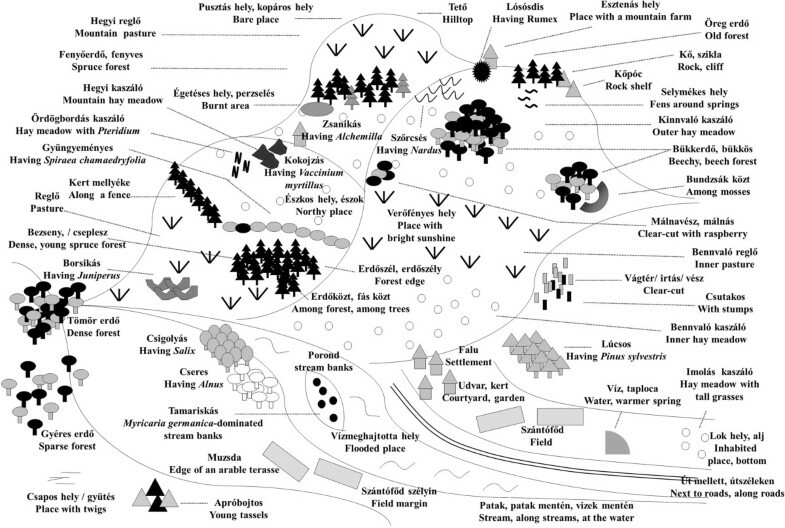 Csángós distinguished altogether 48 meadow types based on their soil, exposure and dominant species. On the other hand, their partitioning of pastures was coarser than that of the herdsmen in the Hortobágy and the Fulani in Burkina Faso [5, 25]. Some Csángó habitat terms are locative, especially in the geomorphological, hydrological sets (e.g. among trees, along streams), and are literally the same as those used in Amazonia by the Matsigenka , Maijuna , or by the Gitksan and Witsuwit’en in British Columbia [13, 26]. Similar locative expressions were also found by Molnár in the Hortobágy steppe . In many Csángó habitat terms used for abiotically salient habitats, the term “place” was used. Martin found among the Chinantec and Mixe people a similar phrase (kam), but for habitats named after the dominant species cf. . “Locative-like verbal expressions” were also used by Csángós (e.g. areas trampled (or not) by animals or humans, Table 6 cf. [11, 13]). In some cases, different people described the habitat of a particular plant species by using different habitat terms. In these cases, the exact meaning of the terms used was often not the same, as they referred to a different (though often overlapping) section of the same environmental gradient, or described the habitat by using another environmental feature. Shepard et al. also documents such examples in the Matsigenka folk classification (“apamankera nia – place of inundation, flooding” and “otsegoa – seasonally flooded island, branch of river”), though without a detailed discussion. A typical example from Gyimes was the terms porond (gravel deposit) and vízmeghajtotta hely (an area often flooded, with erosion and accummulation of gravel and sand). The former was the prototype, emphasizing that the area is elevated, whereas the latter mostly referred also to such places, but emphasized disturbance. The latter and its variants were used 14 times, of which 8 described habitats of Myricaria germanica and bushy Salix spp., species typical of gravel deposits (poronds). Habitats that the studied community hardly knows may also represent important data in terms of folk landscape partitioning . Csángós did not care much about rocky habitats and habitats of the extremely rare aquatic vegetation, and did not consider the differences caused by the heterogenous spatial pattern of co-dominant tall grasses. The former two were insignificant in their economy, whereas the dominant grasses formed a functionally uniform group (broad-leaved, tall grasses) whose division into any further subgroups might have seemed meaningless. While some geomorphological features were also used as a habitat term (e.g. völgy (valley), tető (mountain top), oldal (mountain slope)), others were never mentioned as a habitat (e.g. bitkó (a small peak), nyak (neck), hegyláb (foot hill)). It seems that the former three have a special combination of environmental features, while the others have not. Compared to the scientific botanical classification , the Csángó system was only less detailed in the case of fen communities (communities dominated by Eriophorum sp., Glyceria plicata, Carex spp.) and rocky vegetation. In all other cases, the traditional landscape partitioning was more detailed than the scientific classification [cf. 39]. A special dimension in Csángó landscape partitioning is scale. Scale has two aspects: (1) topographical (spatial scale): some habitat categories (e.g. high mountains, settlements) occupy larger areas often comprising a habitat mosaic of finer-scaled habitats, while others extend only to smaller areas (e.g. stream side, birch woodland), and (2) topological scale: some more inclusive habitat categories (e.g. forest) are subdivided into subcategories (e.g. into spruce and beech forest, dense or sparse forest etc. ), while others are not (e.g. gravel deposit, Nardus grassland). The two aspects are not independent. More inclusive categories often cover larger territories, while less inclusive ones usually cover smaller areas (cf. to different ranks in folk biological species classifications [cf. 1], and in landscape ethnoecological partitionings e.g. [11, 18, 54]). Gilmore et al. for example identified three main categories in his general group of habitats: (1) “cuadu” (lit. soft earth) for the swamp habitats, (2) “aqui” (ugly forest) and (3) habitats without soft earth and ugly forest. Shepard et al. also lists inclusive categories. The Matsigenka nigankipatsa (lit. ‘middle earth’) is a broad category for habitats that are not flooded, but nigankipatsa is not included into any specific biotic/abiotic habitat type (other inclusive habitats: ‘flat area’, ‘many hills’ (= montane vegetation, above 600 m) . Habitats that Csángós distinguished could be arranged into characteristic categories at three spatial scales: macro-, meso-, and microhabitats. Similarly to Shepard et al. , Abraão et al. , and Gilmore et al. , we also found that abiotic features (e.g. geomorphology, hydrology, edaphic conditions) often defined larger, broader habitat categories, while biotic feature-defined habitats used in finer partitioning. Habitats in the land-use set were often intermediate between macro and meso scales. Habitats elicited by Shepard et al. are mostly mesohabitats. Microhabitats are not mentioned. Martin  found that the Chinantec have a keen sense of microclimate. They distinguish sites with a special environment (i.e. microhabitats) that can be used for cultivation of certain plants outside of their zonal range. In conclusion, macrohabitats occupy usually large areas and comprise many habitat types, mesohabitats are usually smaller in extension and homogenous and are often dominated by one vegetation type, while microhabitats are embedded in mesohabitats and provide special niches for particular species. One reason for the use of different scales in landscape partitioning may be ecological, since species occupy somewhat different places (niches) in a landscape, some species are specialist, others generalist. For a precise description of these species-specific habitats a multi-scaled landscape partitioning might be better suited. Csángós never used species composition (list of characteristic and/or dominant species) as one of their features, although species composition is the key feature in recognizing and classifying habitats for scientific purposes see e.g. [34, 39]. Even when they were asked to list the typical species of a particular habitat, they listed only a few species (Babai & Molnár unpubl.). We emphasize that the many habitat terms derived from a species name (Table 3) did not reflect a scientific plant community used by phytosociologists and as suggested by Rab  in the nearby Gyergyó-basin, but only pointed to the most salient species of that spot in case of the Csángós. Indicator species, however, were often used by Csángós in describing plant species’ habitats. These indicator species were not necessarily the commonest ones in a given habitat, but were morphologically or ecologically salient see also [18, 20, 25]. Whereas the majority of indicator species are woody in the communities studied elsewhere [18, 35], the indicator species were primarily herbaceous plants in Gyimes. Species regarded as indicators were mainly very well known in the community, and their habitat preferences were widely understood (Babai & Molnár unpubl.). These features made them well suited to characterize the habitat preferences of other species. The majority of indicator species were ecological specialists in this landscape, found mostly in a single habitat type (e.g. Onobrychis viciifolia, Nardus stricta, Leontopodium alpinum, Tragopogon orientalis). Surprisingly, the list also included some generalist species (e.g. Picea abies) that, however, were used to describe the habitats of other generalist species (e.g. Leucanthemum vulgare, Abies alba). Some meadow types were named after their typical indicator species (Table 12). These species were generally not dominant, but were rather associated with certain characteristics of the habitat, most often with the treatment with manure. Species indicating manured sites were Tragopogon orientalis and Salvia pratensis. Nardus stricta was an indicator species of nutrient poor, acidic habitats at higher elevations. Onobrychis indicated nutrient poor, south-facing slopes. Pteridium aquilinum may become abundant in south-facing and rather dry slopes, whereas Alchemilla spp. reached high abundances at higher elevations, primarily in grazed grasslands. Among the Chinantec and Mixe, Martin  also documented indicator species that are used to indicate soil types suitable or not for the cultivation of certain plants. Csángó landscape ethnoecological partitioning was multidimensional, as it incorporated several sets of features. Multidimensional landscape partitioning was suggested as a general phenomenon by Ellen  and Hunn and Meilleur , and was found among Matsigenka in Peru by Shepard et al. , various First Nations groups in British Columbia , and Fulani pastoralists in Burkina Faso . The number of gradients are usually large in mountainous landscapes, but Csángós have also contributed to an increased number of gradients (or an increased expression of the existing gradients, e.g. on south facing slopes, or along the valley bottoms) by turning the forest-dominated landscape into a more diverse mosaic of grasslands, forests, and arable fields cf. [3, 4]. This resulted in an increased number of combinations of environmental features that plant species can inhabit. Csángó people used these combinations to describe, and name habitats of plant species they use as a resource. Where there is a single dimension of morphological discontinuity, a salient prototype can generate a one dimensional classification of related forms , but the multidimensional nature of habitat dictates that classification too will likely be multidimensional . In Gyimes, several gradients could be recognized in the study area, which served as the basis of multidimensional landscape partitioning (i.e. mountain top / mountain side-valley, forest / bush / grassland, rocky / poor / lush, wet / moist / dry). These gradients were often formed from simple dichotomous pairs cf. , but more stages may have been included between the extremes in the classification of a rather complicated habitat mosaic. 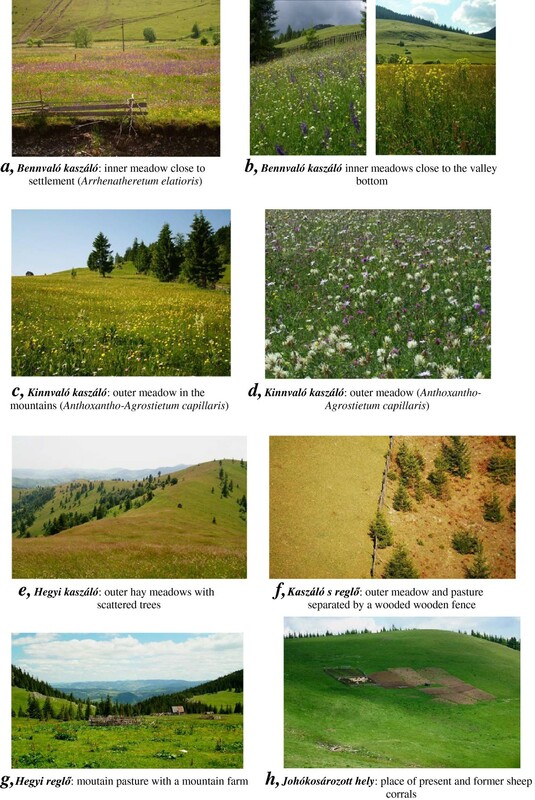 Besides land-use types, these antagonistic pairs formed the basis for the basic-level landscape partitioning, and helped recognize the most salient habitats in the landscape cf. . Environmental features were combined flexibly in habitat descriptions see also [4, 11, 13, 15, 35]. In South and Central America, South East Asia, and Canada, features used in multidimensional landscape partitioning are almost the same as those in Gyimes e.g. [10, 11, 13, 20, 26]. Most of them also appear in Europe (e.g. hydrological, geomorphological, vegetational features) [3, 4, 54]. The most striking exceptions are the successional stages of the swidden agricultural systems, as these agro-forestry systems were banned in Europe by the German-type forest administration during the 19th and early 20th centuries . On the contrary, Molnár  found that herders’ habitat classification in a salt steppe environment (Hortobágy, Hungary) is not multidimensional. He assumed that in the flat, open, and on the medium- and long-term stable landscape, the various abiotic and biotic factors that determine different habitats are arranged along a single (key) gradient (depth of ground-water table), while many possible gradients (e.g. woody / non-woody, mountain / valley, rock / sand, successional, naturalness) are missing. Among the Baniwa people in Amazonia, Abraão et al. also documented a landscape partitioning with only one gradient. The authors could structure forests along this gradient into a single hierarchical system (with 5 ranks) analogous to Berlin’s  folk biological classification system. Based on these experiences, we propose the following hypothesis for testing: multidimensionality of landscape partitionings and the number of dimensions applied depend on the number of key environmental gradients in a given landscape. Hunn and Meilleur  argue that folk landscape ethnoecological partitionings are organized into shallow classifications only. Ellen  goes further by arguing that multidimensionality and the emic multidimensional continuum is what might prevent the development of a single well developed hierarchy. Gilmore et al. found that folk habitat types are grouped into several, separate, overlapping subsystems. Further detailed studies are needed that document emic classifications of habitats to deepen our knowledge on the relations of multidimensionality and hierarchy. In conclusion we argue that multidimensional partitioning of the landscape in Gyimes made the nuanced characterization of plant species’ habitats possible. Multidimensional partitioning provided innumerable possibilities for the Csángós to combine the most characteristic and salient features when explaining the habitat preference of a particular wild plant species in their diverse, semi-natural, and intensively managed landscape. The number of dimensions applied by them seemed to depend on the number of key environmental gradients in their mountainous landscape. a Vegetation can be classified in many ways. Methodologies are based on species composition, vegetation physiognomy, vegetation structure, or environmental factors. For fine-scale surveys, floristic approaches are the best suited. In the so-called Braun-Blanquet floristic-sociological approach, plant community types are conceived as units recognized by their total floristic composition. For a so-called phytosociological survey, relevees are taken, usually several by several meters quadrats. Beside the list, the dominance (cover) of all plant species is given in percent or in an ordinary scale, 1–5. Relevees are subsequently arranged according to floristic similarity. Plant associations are delimited based on characteristic species (species specific to that association), differential and dominant species. With the plant associations described in a region, actual and potential vegetation of the area can be mapped. Plant associations are usually named by using a characteristic and a dominant species. Author(s) of the associations are also given. We gratefully acknowledge all the Csángó people of Gyimes who patiently and generously shared their knowledge with us [Antal (Bucsi) Béla and his wife, Valéria; Berszán Erzsébet; Bükki András; Ferenc Fülöpné (Piroska); Györgyica (Matri) János and his wife, Erzsébet; Jánó András; Jánó Béla and his wife, Anna; Jánó Erika, Jánó (Tódi) György; Jánó György; Jánó Péter; Jánó Tímea, Kis (Cokán) Béla; Kulcsár Péter; Ladó Géza; Prezsmer Károly and his wife, Virág; Tankó (Csukuj) Anna and her husband, János; Tankó (Fintu) Dezsőné (Ilonka); Tankó Imre Emil; Tankó Fülöp; Tankó (Vándor) Károly; Tankó Margit; Tankó Péter Donát; Tankó Tímár Attila; Tankó Katalin and her husband, István; Tankó Tódor, and his wife, Valéria; Tímár Edit; Tímár Dezső, and his wife, Piroska; Tímár Dóra; Tímár Fülöp; Tímár Lukács; Tímár Sándor]. We also thank Anna Varga for helping in data collection, and Lendvai Gábor and Barbara Knowles for language revision. Both authors made substantial contributions to conception and design. DB carried out most of the data collection and analysis. Both authors were involved in drafting and writing the manuscript. Both authors read and approved the final manuscript.